How would you like to put in 18-hour days, seven days a week for 96 cents per hour? Workers cannot count on compensation from the government when they are injured in a fire or other disaster. That is the struggle garment factory workers in Bangladesh face. A total of 1,508 employees have died in the last decade, said Amirul Haque Amin, president of National Garments Workers Federation. 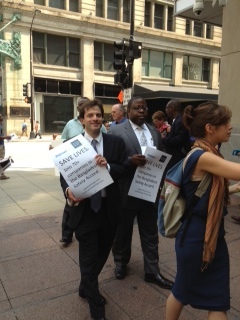 Chicago Newspaper Guild Executive Director Craig Rosenbaum, Guild President David Pollard and Communications Director Beth Kramer joined Amin, International Labor Rights Forum, United Students Against Sweatshops and Rainbow PUSH Coalition Tuesday, July 9 to picket outside the Gap store in Chicago. Gap, Target and Wal Mart are among the retailers who buy clothing from Bangladesh. The picket was a demonstration demanding the Gap sign the Accord on the Fire and Building Safety in Bangladesh to keep workers safe. “The workers of Bangladesh are trying to organize to get things like a livable wage, a decent night’s sleep, a day off and work in a place where they know the roof will not fall in on them or some other catastrophe due to shortcuts in construction. Guild members, we should not take for granted the rights we have earned because the injustice that is taking place in Bangladesh isn’t as far away as we may think in terms of our own contract under the MOU,” Pollard said. Participating in the Gap demonstration was an opportunity to network with the progressive organization that fights for social change. The Rev. Jesse Jackson Sr., Rainbow PUSH Coalition founder and president, spoke about uniting in solidarity to support the Bangladesh workers. Jackson told the Chicago Newspaper Guild that he was aware of the Sun-Times Media photography firing. “Workers are under attack for the bottom line. In virtually every industry, they’re closing auto plants, closing newspapers, laying off photographers …the result of this austerity is they are getting less and less,” Jackson said. There are 4 million workers in Bangladesh laboring for their $38 a month, Amin said.About 85 percent of them are women, who also face sexual harassment and live in slum areas lacking water and electricity because that’s all they can afford, Amin said. Unlike Chicago Newspaper Guild, these workers are not allowed to organize themselves for better working conditions, Amin said. He called working conditions in Bangladesh a “death trap.” A building housing five factories killed 112 employees and injured 150. There are daily demonstrations in Bangladesh. “We are constantly fighting to change these circumstances,” Amin said. Amin is the United States to urge American retailers to sign the Accord on Fire and Building Safety. Gap and Wal Mart have made unenforceable promises, Amin said. Chicago Newspaper Guild Executive Director Craig Rosenbaum and President David Pollard join Rainbow PUSH Coalition, International Labor Rights Forum and United Students AGainst Sweatshops to demonstrate outside the Gap in Chicago to advocate for better working conditions for Bangladesh garment workers. Fantastic effort. To bolster workers in third world countries is to improve the conditions, benefits and salaries for all.